What is an install referrer? An install referrer, otherwise known as a Google install referrer, is an identifier unique to Android devices which enables marketers to attribute ad activity to media sources for Google Play Store apps (not supported on Android out of store). An install referrer is one of three main ways of performing user attribution, in addition to ID matching and fingerprinting. The install referrer is essentially a string of code that the attribution provider uses to send tracking parameters to the Google Play Store when an ad is clicked. Once this occurs, they are then passed back to the source when the app is downloaded. At AppsFlyer, the install referrer is used to pass the original URL of the ad back to the AppsFlyer servers before redirecting to Google Play. Why is install referrer important to attribution? Install referrer is one of the most accurate methods of measuring user engagement with ads, especially compared to fingerprinting. In fact, an install referrer guarantees as close to 100 percent accuracy as is possible, considering bugs or other potential issues that may arise. 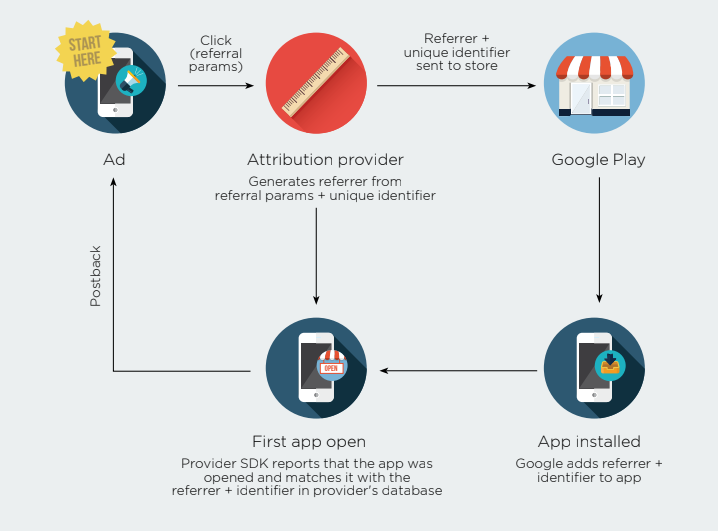 Overall, install referrer, along with ID matching, gives Android not just one, but two highly accurate options for attribution, a clear advantage in understanding the full story of an app install. In the install referrer matching, a custom tracking ID, which cannot be reset, is automatically added to the referrer string by the attribution provider before being sent to the Google Play Store. In turn, it removes the need for a network configuration, leaving the attribution provider dependent only on itself. In addition, the newly released Google Referrer API, developed jointly by AppsFlyer and Google, significantly reduces the amount of install hijacking fraud that occurs with the install referrer. This gap is closed by authenticating referrer data and actively blocking referrer injection. In other words, the new install referrer allows marketers to understand what users are doing between a click on an install referrer ad and install. In turn, marketers are better prepared to combat install hijacking fraud, as well as to make better product and marketing decisions.